Matthew R. Bailey, president of the B.C. 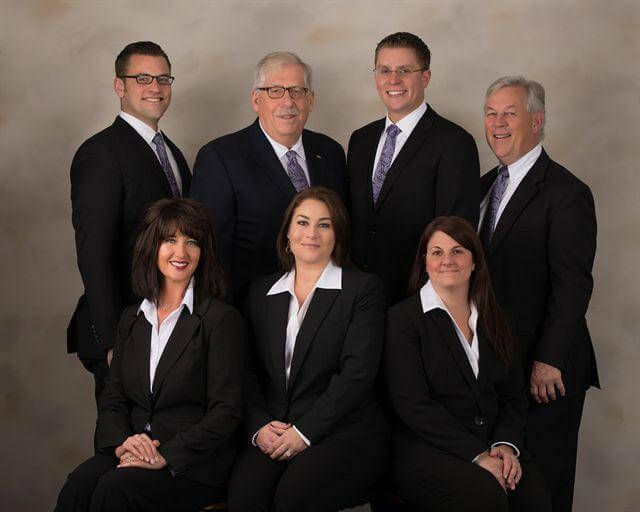 Bailey Funeral Home, is the fourth generation of the Bailey family to serve the community. He attended Holy Trinity School in Wallingford and Xavier High School in Middletown prior to his studies at The Catholic University of America(CUA) in Washington, DC. From CUA, he received his Bachelor of Arts degree. While in Washington, Matthew received his Third Degree with the Knights of Columbus CUA Council # 9542 and was employed by CUA and the Basilica of the National Shrine of the Immaculate Conception. While at CUA, he served on the Undergraduate Student Government's Executive Board in the position of Legislative Vice President. He was recognized by Who's Who in American College and University Students. Matthew was a student at the America Academy McAllister Institute of Funeral Service (AAMI) in New York City where he was elected by his peers to serve as class president. Following his graduation from AAMI and successful completion of the Funeral Service Conference Examining Board's National Examination, Matthew joined the B.C. Bailey Funeral Home full time. Matthew is a member of the Benevolent and Protective Order of Elks and is a member and past president of the Wallingford Rotary Club. He has served on the boards of the Rotary Club, the Wallingford Foundation, the Connecticut Funeral Directors Association, the Wallingford Family YMCA, and the Wallingford Public Library. Matthew has served as a member of the faculty at the American Academy McAllister Institute of Funeral Service in New York City. He has been certified by the Cremation Association of North America as a Crematory Operator and is a certified celebrant and a certified celebrant trainer through the Insight Institute. He holds the distinction of being recognized as a Certified Funeral Service Practitioner by the Academy of Professional Funeral Service Practice. Robert B. Bailey, president-emeritus, joined his father in the business in 1967; and except for a tour in the U.S. Air Force from 1970 to 1974, he has continuously served the community. He was a graduate of Leicester College in 1966 and graduated from the American Academy MacAllister Institute of Funeral Service in 1967. Robert and his wife, Darlene Cannata Bailey, have three grown children: Michele Bailey Chaudhry, Michael R. Bailey and Matthew R. Bailey. Robert is active in the community as a past president of the Wallingford Rotary Club being honored as both a Paul Harris Fellow and Rotarian of the year. He has served as the vice president of the In Memoriam Cemetery Assoc. He has also served on the boards of the Wallingford Jaycees, Wallingford Family YMCA, the Wallingford Symphony Orchestra, and the former Meriden-Wallingford Hospital. He is a member of the Connecticut Funeral Directors Association and the National Funeral Directors Association. Julius (Jayson) A. Dahlgard IV is a native of West Haven, CT, and has been part of the B.C. Bailey team since 2013. He is a graduate of Notre Dame High School of West Haven, and attended Roger Williams University in Bristol, RI. Jayson acclimated himself to the Wallingford and Meriden area by working as a letter carrier at the United States Postal Service while attending Lincoln College of New England in Southington where he studied mortuary science. Graduating in 2014, Jayson successfully completed the International Conference of Funeral Service Board examinations, served his residency here with us, and became a licensed funeral Director and embalmer. He also manages our memorial monument and marker division of Connecticut Life Tributes, Connecticut Memorials. Jayson is a member of the Wallingford Benevolent and Protective Order of Elks, Lodge #1365, and enjoys golfing at the Wallingford Country Club. Tarn Granucci grew up in Wallingford, the son of Harold and Sara Lou Granucci. His family heritage in Wallingford goes back to 1890 when his great-grandfather moved here. Tarn grew up as a Unitarian which provided him with a wide and balanced perspective on all views and faiths, religious or non-religious. He also grew up in the family furniture business and took it over in 1979. In that business, Tarn connected with many families in the community and serviced them in their homes. He has served on the boards of many local organizations as well. Those would include: Rotary Club of Wallingford, Wallingford Family YMCA, Better Business Bureau, United Way, Meriden-Wallingford Hospital, Quinnipiac Chamber of Commerce, Wallingford Public Library, Mayor's Council for Substance Abuse, Hubcap Co-working Space, and others. Tarn has a degree in Transpersonal Psychology, he is the author of Legendary Locals of Wallingford, he is the first Poet Laureate of Wallingford, and he is the Editor of Wallingford Magazine. Tarn is an InSight Certified Celebrant which means he has been trained and certified as a Funeral Celebrant by InSight to meet the needs of families during their time of loss. A Funeral Celebrant serves by providing a funeral service, memorial service, or tribute that is personalized and individualized to reflect the personality and life-style of the deceased after consultation with the family and loved ones and coordination with the funeral home. Tarn is proud and honored to have the opportunity to be in this important role and to serve those in need at such a difficult time. He selects and presents poems (some written by him for the family), other writings, music, song and family memories to enrich the services and reflect the nature of the person who has passed.